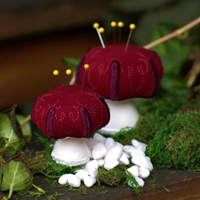 Mushroom Pincushion Create a charming stuffed mushroom pincushion for your sewing room! 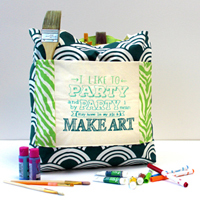 Craft Tote Keep your crafting tools organized in this personalized multi-pocket tote bag! 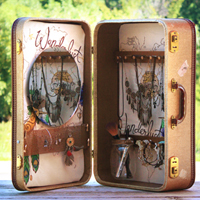 Wanderlust Suitcase Vanity Embrace your wanderlust with this upcycled vanity. This easily cutomizable home decor piece is great for jewelry and more. 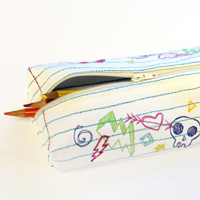 Doodle Pencil Case Craft a fresh start to the school year with a zippered pencil case, stitched like notebook paper and decorated with doodles! 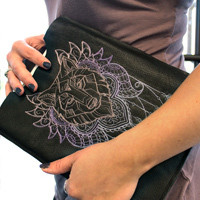 Leather Tablet Case Light, open, running-stitch designs are perfect for embroidering on leather to make a snazzy case for your gadgets! No Sew Wall Pocket Whip up one or several of these little embroidery-hoop organizers to keep your crafty stuff stashed in unique style! 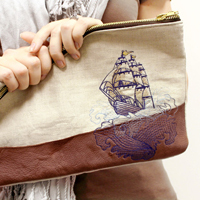 Leather & Linen Tattoo Clutch Combine the natural textures of linen and lace to create a stylin' clutch! 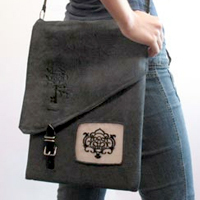 Light-stitching embroidery works great with leather. 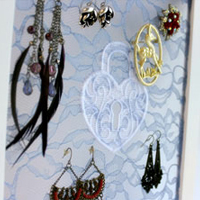 Lace-on-Lace Jewelry Holder Craft a quick, cheap, and chic jewelry holder with lace-on-lace in a frame -- we'll show you how. 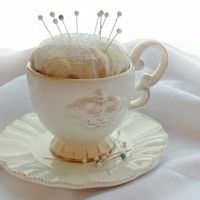 Teacup Pincushion Treat yourself to a classy teacup pincushion! It's a great way to reuse an ever-so-slightly chipped favorite teacup. 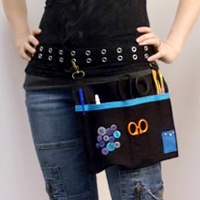 Crafty Tool Belt Don't let a search for your favorite scissors slow down your creative frenzy! Keep your most used tools at the ready. CD Holder Treat your CDs right! 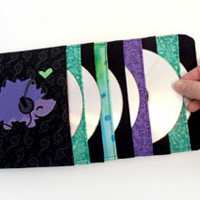 Make a car visor CD holder that's orderly and neat and involves rockin' cute embroidery. Zippered Pouch This little zippered pouch is surprisingly easy to sew, and it's perfect for stashing makeup, craft supplies, and more! 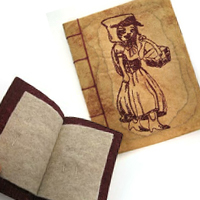 Ye Olde Needle Book Stash the tools of the trade in a coffee-stained, hand-bound needle book that looks like an old enchanted library tome! 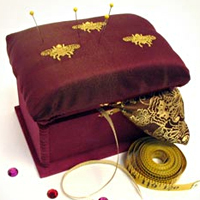 Regal Sewing Box Stitch like French royalty with this luxurious sewing box, featuring Napoleonic bees on the puffy pincushion top. Knitting Needle Roll Carry knitting needles (or other implements of creativity) will be snug and secure in a needle roll full of personal flair. 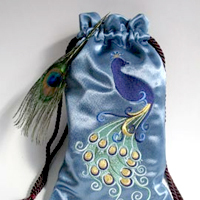 Pretty Peacock Pouch Stitch this drawstring bag big or small, frilly or utilitarian, for all your stuff-toting needs. 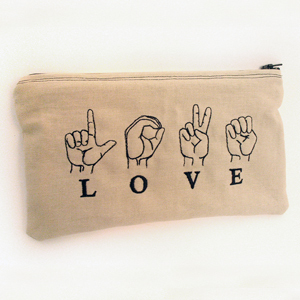 Lock & Key Laptop Case Stitch a cool sideways laptop case to tote your technology in style, with embroidery in a swank peek-a-boo window! 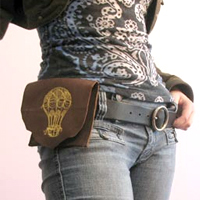 Leather Hip Pouch Embroider on leather with the right needle and some special hooping techniques, then craft a cool hip pouch. 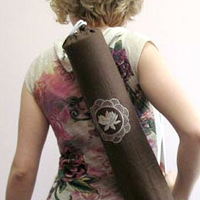 Yoga Mat Carrier Craft some inner peace with this sleek, simple yoga bag, embellished with your favorite blissful design. 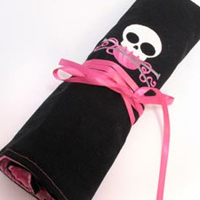 Needle Book Crafting Kit This crafty little needle case comes with its own little skull pincushion and can be customized to fit your crafting needs. 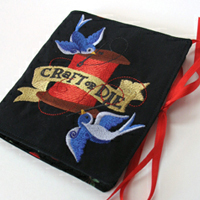 Crafty Clutter Case You woodn’t believe that you can embroider on wood. But you can. 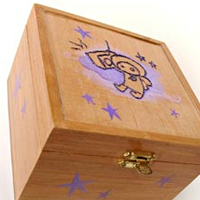 And clean up your craft area with the result. 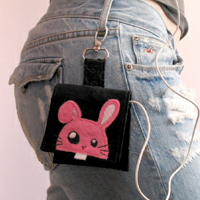 iPod & mp3 Cozies A sweet embroidered cozy for an iPod or mp3 means that you’ll be stylin’ while you’re jammin’. Floyd's Coin Purse Store loose change or miniature bananas in a sleek vinyl coin purse. Great for humans and furry pink primates.